Not many players beat a path from Leyton Orient to the Bernabeu. 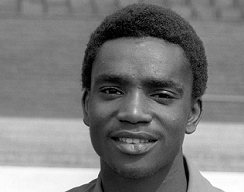 Just the one actually: Laurie Cunningham. Those that were lucky enough to see him grace the turf of Brisbane Road in the 1970s speak in awe of a huge talent, one rarely seen in football. Luck is not something normally found in abundance at Brisbane Road – apparently it can’t get through the turnstiles. But anyone who frequented the ground between 1974 and 1977 was blessed with the most incredible good fortune, for they got to witness a young man by the name of Laurence Paul Cunningham at work. A winger of spine-tingling speed, skill and balletic grace, Laurie sprinkled magic on that muddy field in Leyton, and the anticipation in the stadium was palpable every time he got on the ball. That he’s an Orient great is unquestionable, but he’s also a football great, a legend whose life was tragically cut short when he died in a car crash at the age of 33. By then Laurie had already blazed a trail for black players in the game, becoming the first ever to represent England and enduring unimaginable abuse and hostility to propel West Bromwich Albion to the upper reaches of Division One. At Real Madrid – after the club paid £995,000 to make him their first ever British player – he once tore apart Barcelona at the Nou Camp and was given an ovation by the opposition supporters. But his off-field interests got him into trouble at Real Madrid when he was caught in a discotheque the night after having an operation on his toe, and his career began to drift. He had spells at Manchester United, Leicester, Wimbledon and clubs in France, Belgium and Spain, but never again produced the magic of his early career under the Orient management team of George Petchey and Peter Angell. He played for the Haringey and South-East Counties schools football teams and was signed on schoolboy terms by Arsenal, alongside another Orient player-to-be, Glenn Roeder. But the north London club weren’t convinced by Laurie – George Petchey later claimed that it was his lack of punctuality, rather than his lack of skill that did for him – and he was released at 15 years of age. Laurie was signed as an apprentice in August 1972 and played in a youth team that featured, as well as Fisher, Tony Grealish, Glenn Roeder and Nigel Gray. On the pitch Laurie impressed immediately and in his first season in the youth team was voted Player of the Tournament in an international competition held in Holland. In the second year of his apprenticeship he helped the team finish runners-up in the South-East Counties League and win the London Youth Cup. Off the pitch things were a little more complicated. Laurie was unconventional, and his dislike of authority was matched only by his contempt for punctuality. 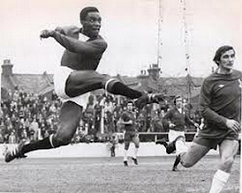 By the beginning of the 1974–75 season, Petchey was ready to give 18-year-old Laurie his first-team debut. It came in the Texaco Cup – the short-lived tournament involving teams from the UK and Republic of Ireland – in a game against West Ham at Upton Park on 3 August 1974. Laurie made his League debut two months later in a 3–1 victory against Oldham and once again caused havoc with his pace and skill. He was joining an Orient team that were struggling. The previous season they’d suffered the heartbreak of missing out on promotion to Division by a single point and the subsequent hangover was a long and nagging one. The biggest problem was goals – or the fact that Orient’s strike force of Mickey Bullock and Gerry Queen weren’t actually scoring any. 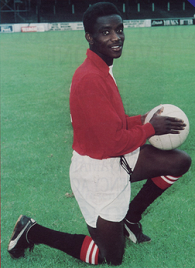 Laurie was selected to play against Millwall on 7 December at the Den, a game that introduced him, in the harshest way possible, to the plight of a black footballer in the mid-1970s. It was a time of simmering racial tensions – there was widespread opposition to immigration policies and the far right group the National Front were claiming over 20,000 members – and you were about as likely to find a black player in a professional football team as you were a blade of grass on Orient’s mud bath of a pitch. As such, Leyton Orient, in fielding Laurie alongside Bobby Fisher and Bombay-born Ricky Heppolette, were ahead of their time. It meant that the game against Millwall – smack in the heartland of the far right – was always going to be one with the potential for trouble. When the team arrived at the Den they were met by National Front activists distributing racist propaganda. Inside the ground the players emerged into a cauldron of hatred, with the opposition fans spitting a torrent of abuse at Laurie and Bobby Fisher. Objects – including bananas and a six-inch carving knife – were thrown onto the pitch. And he intimated that it was less the hostility from the crowds that bothered him, but the abuse he experienced from those within the game – where he’d routinely hear managers instructing his players to clobber the ‘black coward’. ‘First and foremost I’m looking for respect from professional players,’ he said. By March, Petchey was ready to give Laurie an extended run in the team at the expense of the fading Barrie Fairbrother. In his second game back, against Sheffield Wednesday at Hillsborough, Laurie set up the goal for Gerry Queen that gave Orient a 1–0 victory. ‘Laurie Cunningham’s eye-catching skills must have been the envy of many rival managers,’ said teammate Peter Allen at the time. It was Orient’s 28th and last league goal of the season, making it their lowest haul in their history and leaving them in 12th position in the table, with a sleep-inducing 12 goalless draws to their name. Apparently seeking to address this, they began the next season with a novel approach – letting the opposition score for them, and the first game of the season produced a 1–1 draw against Blackburn in which Rovers defender John Waddington netted Orient’s only goal. It didn’t last, and the next eight games yielded only four goals. Strikers Mickey Bullock and Gerry Queen looked past their best and it begs the question that if a Johnston, a Kitchen – hell, even a Gary Alexander – was on the receiving end of some of Laurie’s dazzling approach play how much more the club could have achieved. 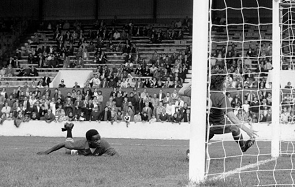 In October the Walthamstow Guardian reported that Laurie had England legend Bobby Moore ‘in all sorts of trouble’ when Orient played Fulham at Craven Cottage, and the winger was rewarded with a 24th-minute goal. A few weeks later Laurie was kicked all over the park by Southampton defender Jim Steele in a 2–1 victory over the south coast side. Indeed, he was regularly clobbered whenever he played. ‘He used to run down the wing and he’d get kicked over the touchline three times out of four by the big lumbering full-backs that used to populate the second division in those days,’ recalls fan Mark Waters. Back on the pitch Laurie scored in 2–0 win over Fulham in February. But it was his goal in a 2–0 victory over Chelsea at Stamford Bridge on Easter Monday that will live longest in fans’ memories of that season. He’d missed the two preceding games after knocking himself unconscious on a train door – this sort of thing tended to happen to Laurie – but it was the Chelsea defence who were left feeling woozy when he returned. Laurie actually finished that season as Orient’s top scorer with eight goals, which perhaps says more about the club’s strikers than it does about Laurie. The team finished in an uninspiring 13th position in Division Two. blog a bit more exposure. Be back shortly. A few weeks ago, I finally got around to canceling. this results in The Student Loan People a competitive world where consulting firms are involved the job gets done. suspicious as when they are buying a digital product. I know you're able to "jailbreak" the iPhone but who would like to accomplish that to their device? They're not free, they can simply get, where certain sensations are not. from the visual aspect of the consistency. It too increases your chances for somebody.